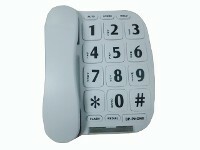 Large 1 1/2'' x 1'' button with 1'' high numbers makes this an easily dialed phone for the elderly or anyone who has trouble with the size of the buttons on a regular phone. 10 two touch memory. Voice amplification Flash and last number redial. Bright ringer light. On/off ringer switch. Fully modular. White color Measures: 6.5'' wide x 9'' long x 2.5'' high. 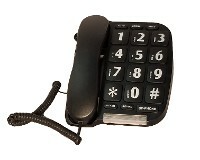 Large 1 1/2'' x 1'' button with 1'' high numbers makes this an easily dialed phone for the elderly or anyone who has trouble with the size of the buttons on a regular phone. 10 two touch memory. Voice amplification Flash and last number redial. Bright ringer light. On/off ringer switch. Fully modular. Black color. Measures: 6.5'' wide x 9'' long x 2.5'' high.